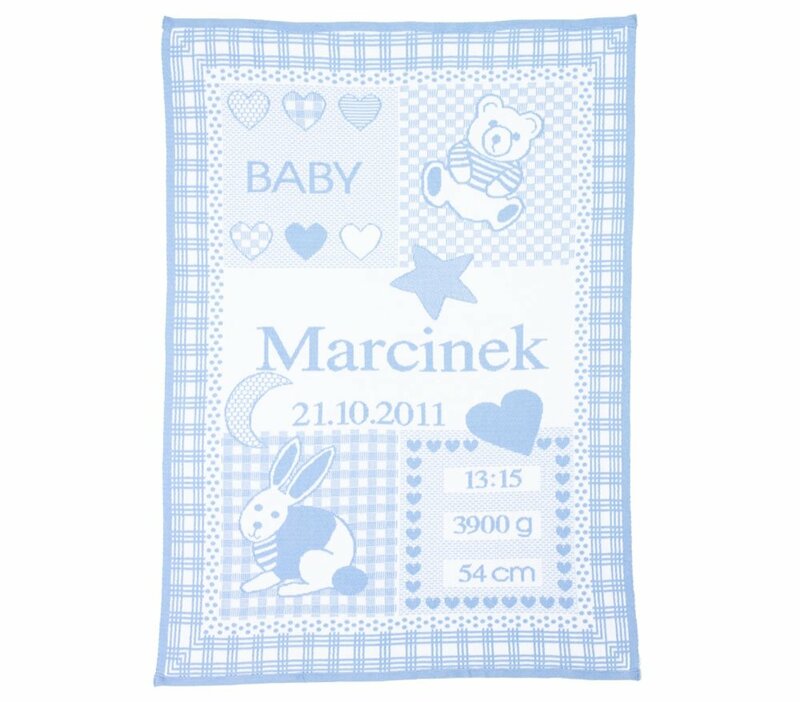 My blanket on which is the name of the child and the day of birth, the time of birth, weight and height measured when the baby is born. Personalized blanket is made of breathable 100x75 cm organic cotton. The perfect gift for a newborn baby. The name can be diminutive (Robbie) or official (Robert). Decide in what form we put it on the blanket. Do all the letters have to be capital ( ROBERT ), or small (Robert) ? We will adjust the size of the name on the blanket according to the number of characters. Choose the hour and minutes. If you want the time on the blanket to be given with the "pm" or "am", write it in the "comments" box below. If you don't want to have the time on the blanket, just don't choose any number. Choose weight of the child on the day she/he was born. We always write the weight in grams. If you don't want to write the weight on the blanket, please don't write in this field, leave it empty. Choose height of the child on the day she/he was born. We always write the height in cm. If you don't want to write the height on the blanket, leave this field without any numbers. Write here for example, to mark different data or write it in a different order. In this window, do not put additional dedications on the blanket, we will not be able to implement them. Your own dedication we will place in the upper-left corner of the blanket. Popular dedications are eg. 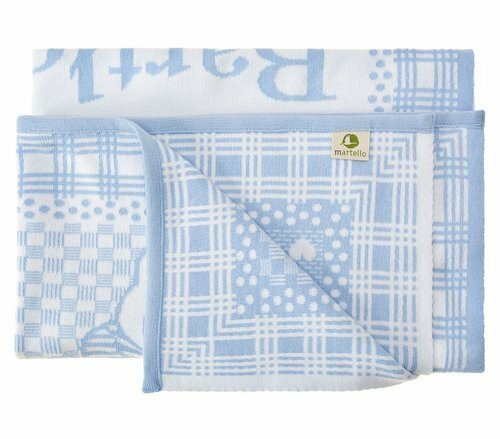 Baptism day, My blanket, From your uncles, Happy birthday. This product is certified by the Global Organic Textile Standard CU 832395. The GOTS logo with the certificate number on the insert gives you confidence that the entire production cycle is under the control of one organization.Cotton comes from organic farming, the yarn does not contain toxic compounds and oil for machines - heavy metals. Production takes place without chemicals, responsible for the environment, people work with dignity, in safe conditions, and the product is healthy and lasting for years. Bunny, teddy bear and BABY lettering in hearts form the oldest and iconic pattern of My Blanket. This is the most ornate of all dedicated blankets. The pattern with a bunny is best suited for an additional dedication on a blanket, which we place between the hearts in the upper left corner. It is also a blanket chosen for a baptism gift.